Heartfelt Balance Handmade Life: Passing on Awards!! ~~She has a very cute blog about how she's "Livin' the Dream". She has 6 kids and lives on a farm. She's as cute as she can be and somehow manages to make life look easy, even with those aforementioned 6 kids! She's inspirational and has started a new Friday hop called "Crowning Moments". You should stop by some Friday and share your crowning moments with her. Steph at "Pendants by Steph" for the "One Lovely Blog Award"
~~She makes the cutest stamped pendants, charms and keepsakes. And she's very, very sweet. Definitely stop by and check out her stuff! and Thank you to Jennifer(Jen) at "Our Journey" for the "Sunshine Award"
~~Her family is just starting their journey with homeschooling. She loves getting deals and just seems like a sweet, down-to-earth person. Stop by and wish her luck with their first year of homeschooling! Michelle enjoys traveling and staying active and telling about all of the cool fun things to do in her home state of Utah. Usually as part of accepting an award, you must tell 7 facts about yourself. So, although I think I've told everything there is to know about me, I'll try again. The Builder went through his first hurricane when he was 5 months old. We were supposed to go home (I still call FL home, which drives my husband crazy) in the beginning of September, but the trip was cancelled because of a hurricane. We went home 2 weeks later and got hit by a hurricane. That was the year Central Florida got hit 3 times in a row. My dad made me play little league basketball in the 8th and 9th grade. He was the coach. He told me I ran like a girl. I'm just not that athletic. I was good at free throws though, so they would put me in and just hope that I'd get fouled. I always wanted to be a ballerina, but never took ballet. Everyone in my family told me I couldn't do it because my feet were flat. The summer after my freshman year in college I worked two jobs. I once went 30 days without having a day off. I have no idea where the money went! I think I bought a lot of clothes. The entire time I lived in Tallahassee(9 years), I had 17 roommates. I don't think I'd be able to name them all now. I cracked my wrist at a roller-skating rink when I was in the 7th grade. The rink thought it would be a good idea to turn all of the lights off, give people glowsticks and let them skate to "Twilight Zone". Someone came from behind me and knocked me over. 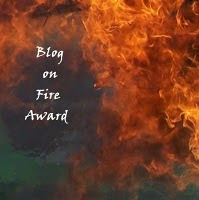 Now, I need to pass the awards on to 10 newly found blogs. These are in no particular order. 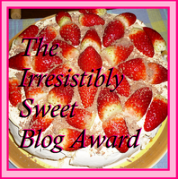 They are just blogs that have either amused me, made me smile or inspired me in some way. 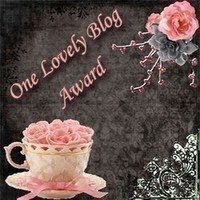 Congratulations to you all!~~You can choose which ever award above you think befits your blog! Haha! A choose your own award-award. Fiery, sweet, lovely or sunshiney! "La Dulce Vida~~The Sweet Life"
Thanks again to all of my "awarders" and to all of the "awardees". All of you guys really rock! !